Just think, less than a month till Christmas.... (aakkk!!!) Are you ready??? If you're like me, you probably find yourself so busy this time of year that you don't seem to have time to get much scrapping or crafting done. Then I had a thought..... SKETCHES!!! And you can even check out the sketches section of our very own gallery for some great sketch inspiration. Give some sketches a try this holiday season. I bet it'll keep you hopping through the new year. Also, don't forget, Monday is December 1st which means the Creative Team will be revealing their creations with the scruptious December kit Frosty Holidays featuring the beautiful SEI Alpine Frost collection. You know how once in a while you'll set your eyes on a layout...and there's just something about it...you can't quite place your finger on it and you don't know why...but you fall in love with it? Well that happened to me this week when heather uploaded this layout for a challenge from our last crop. I don't know why it hit me like it did, but it did! LOL So much, that I did a SHAMELESS lift of it today! Yup, yesterday was the reveal of the November Card Kit Urban Cheer and also our monthly scrappy hour. Our last card kit of the year is sure to please! We've put together a fabulous package starting with the Basic Grey Urban Prairie Paper line (18 sheets of coordinated solids and patterns), added in a sheet of matching chipboard die cuts and more than two-dozen coordinating Basic Grey brads in assorted sizes. Along with the colorful paper and accents, you will also receive a Daisy Bucket sentiment stamp, a Prima image stamp with sentiment plus a whole package of Cloud 9 Epoxy Quotes! These are bound to sell out quickly, don't miss your chance to get one! Check out the gorgeous projects the very talented Jen created using our card kit. Our very own Virginia hosted a fun little project for our Scrappy Hour that is just perfect for this time of year. Her gorgeous bows are so fun and easy to make. Check out her tutorial here to make your own. You'll be so glad you did. I was so thrilled with this birthday party set that Brenda (scrapmilly) made! I just LOVE cupcakes so it was an easy choice for me this week! She made some more cupcake cards so you'll have to check out her gallery to oooh and aaah over them too! Does it get earlier every year??? Is it me or do the rest of you feel that the Christmas season seems to get earlier every year. This year I couldn't believe how soon the holiday decorations were out! Of course, I'm not complaining because I've already bought a few things!! I just love the holiday season. Seeing as there's so much of it around us already what better time to start working on little projects and gifts for your family, friends and your home. 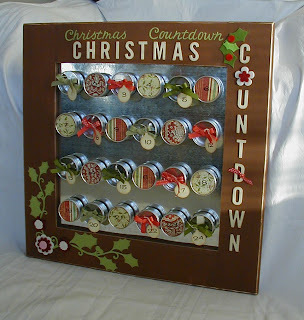 Last year I made an advent calendar. Not your typical one but something I know my kids look forward to every year. If you've never made one now is a perfect time to do so. You could even get your children to help you. I made mine from a large 36" sqaure wooden magnet board which I painted brown. 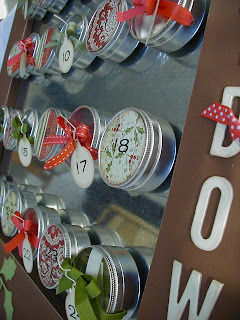 I found some small round tins and glued magnets on the back of them and covered some of the tops with patterned paper, each one I adhered a rub-on number, I tied some ribbon around a few of the tins, I used my Cricut machine to cut out part of the title and holly leaf design as well as some little tags, some chipboard letters (which I painted). I had a blast making this and am so excited to fill it with little candies, craft ideas, stories or jokes, etc for our family to do during December. Here's a couple of pictures of my project. Hope you like it! I just love this layout...the color combo...the fab photos...gorgeous work Denise! The DT has decided to change the challenges up for the month of November. I like to think of November as the 'calm before the storm' and instead of running around frantically in December for all those last minute gift ideas, wouldn't it be nice to get a head-start on your gift list? Well, we want to help you out with that...hence 'The Twelve Days of Christmas' challenge. Come on, you all know the song right?!? For each day of the song, a DT member has thought of a challenge that could be given as a gift to that someone special. So far we've had 4 days up and the ideas have been fantastic. Let's see...we've had a gorgeous stained glass card, a lovely sentiment box, a snazzy container to hold some yummy cookies and a cute embellished picture frame. You can check them all out here. I can't wait to see what's next...can you? Don't forget ladies, there is also a $20 gift card up for grabs. All you have to do is try one challenge from each DT member for your chance to win. Good luck and I can't wait to see all those wonderful gifts. There's going to be a lot of happy people this holiday season!! So that means it must be 10% Tuesday!!! Shop until midnight and save 10% on almost all regular priced items storewide! Use the coupon code "tuesday10" when you check out. There is also so much new stuff in the store. The Basic Grey Wassail is literally running out of the store. The new Crate Papers Lemon Grass and Mia are in and are absolutley gorgeous. If you haven't gotten your hands on this you'd better get some. Also, the new Ranger Distress Stickles are in stock as well as some new Tim Holtz Grungeboard and Fragments. The new Pink Paislee Pixee Stix are just the cutest and coolest thing in glitter. And so much more!! What better time to check out the new goodies than 10% Tuesday!!! Well we had a very productive week in the gallery with our DT reveal! This kit is just fabulous and the girls did not disappoint! But without further adeau I'd like to introduce Rebecca! She is a new member here at SSZ and she has already caught my eye with her very first gallery upload! This month's kit Perfect Prudence features the Prudence line from Crate Paper and is a real beauty. Our favorite line from Summer CHA. Crate Paper is back and better than ever! "Perfect Prudence" features almost the entire Prudence Line! Includes 6 double sided Patterned Papers, 2 die cut papers, Glitter die cut package, Giltter Die Cut Borders, Epoxy Buttons, Textured Brads, Rub Ons, and Alphas. We've added 8 matching cardstock in Aqua, Java, Bark and Auckland. The last two items to tie it together, are 2 yards (assorted) of Making Memories Paperie Ribbon, and Prima Gemstones in Sage. The Creative Team worked just wonders with this kit. The work is just gorgeous. Here are some layouts from the Team. Make sure you check out the Gallery at Scrap Shotz for the rest of the beautiful Creative Team creations.